I've been blogging six years now. My 'blogiversary' was two days ago and although I never set out for this space to be anything other than a fun hobby, it seems it's beginning to lead me places I never dreamed of. In the past year it's lead me to award nights, TV appearances and even, in a roundabout way, to the mentorship scheme which will see me attempt to write a children's book (or two). This month I have made it into the glossies. Yes, plural! I have had this piece published in the latest edition of Maternity and Infant Magazine and had two craft projects published in Easy Parenting Magazine. 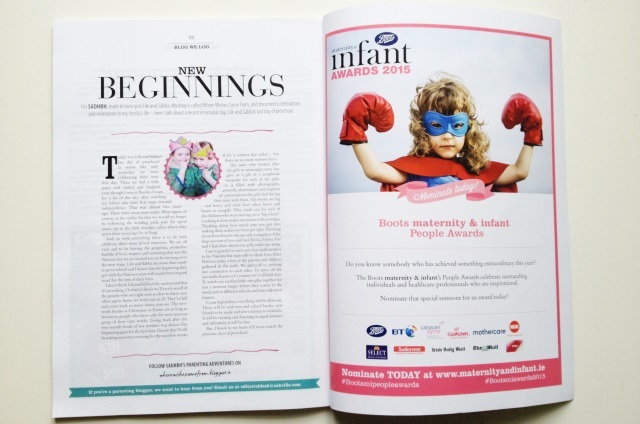 Maternity and Infant very kindly placed my article at the back of the magazine - right next to the information about the Boots Maternity & Infant Awards - in which you can vote for me, by the way! And they used one of my favourite photos of Lile and Sábha too, which makes it a real keepsake. 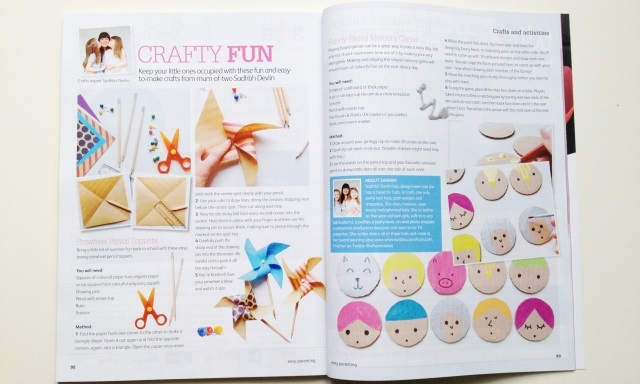 I loved creating these two crafts for Easy Parenting and am absolutely thrilled with how the spread looks. The 'Pinwheel Pencil Toppers' are sweet and simple, but I especially loved making the 'Funny Faces Memory Game'. My girls have been playing with it quite a lot here since I made it so I know it's definitely something that children will enjoy making for themselves. I'm really happy that my writing and making has started to find a way beyond this little patch of internet and 'getting published' has inspired me to push myself a little further along this path and see if I can make that a bit more of a regular thing. With the 'Back-to-School' vibe in the air, I've got plans and dreams coming out of my ears and I can't wait to be back in a routine to start realising them. 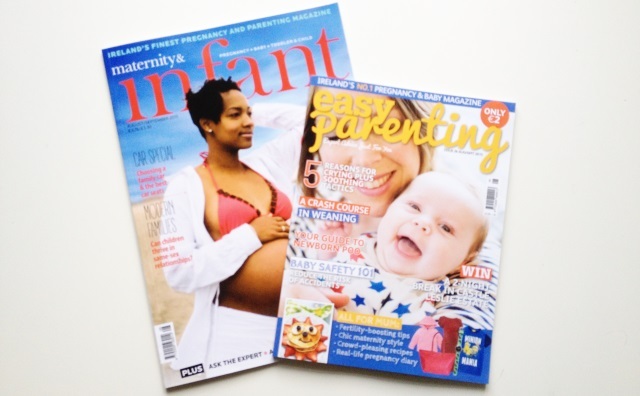 You can find both Maternity & Infant Magazine and Easy Parenting Magazine in Eason's and on many, many other newsstands nationwide. Fancy giving me a 'blogiversary' gift?! Voting is still open for the Boots Maternity and Infant Awards and I still need your votes! Please click the image below, scroll all the way down to the 'For the Family' category and find Where Wishes Come From under 'Best Parenting Blog'. Ahhhhh happy blogiversary to you too, Sadhbh! I had no idea we were blog twins! Two days apart ... And a year. So, no. That doesn't really work at all does it. I think you of all people know what twins are, and that's not it.